Shonda Rhimes is important. She is critical. That it has taken the mainstream media this many years to discover and talk about this speaks to the ways in which we discuss the creation of entertainment and the systems within the entertainment industry itself. The entertainment industry is male-dominanted, exclusive, and isolationary. Shonda Rhimes – a writer, producer, and showrunner who at one time maintained three successful television shows (Grey’s Anatomy, Private Practice, Scandal) at the same time on one network – bucks this industry standard, instead creating work that is inclusive, unique, feminine and fun. These traits are not typically used to describe Important Television, but Rhimes’ rate of success over failure, fandom over derision, deserves further examination and praise. Shonda Rhimes is a feminist. She might not say it explicitly, but it can be seen in her shows. They stem from a female perspective. This is a reflection of Rhimes herself. She is a female writer, producer, and showrunner, an extreme rarity seen only in a handful of recent examples (Lena Dunham and Mindy Kaling most notably). Rhimes controls the content of her shows. They are born out of her vision. And it is her vision that turned many from indifferent to appreciative. 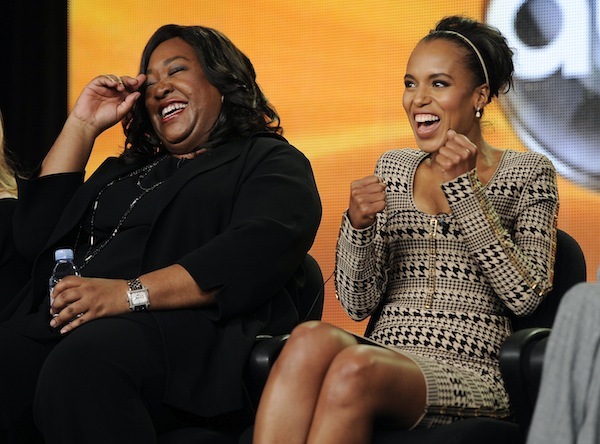 Rhimes’ shows feature female lead characters. This strong vision can be seen through the actions of her characters – their decisions to openly discuss and have abortions, their struggles over life choices in work and home life – and even the conceit of the shows themselves. She explores their inner lives, desires, wants, and concerns and takes them seriously. Audiences witnessed Grey&apos;s Anatomy&apos;s Christina Yang’s (Sandra Oh) forthright desire to have an abortion when pregnant. The first time, she suffered a miscarriage before the procedure. The second time, years later, she underwent the procedure, never wavering from her desire to not be a parent. That millions of viewers saw this on primetime television and the world did not implode shows that Rhimes’ vision is a reflection of the very real inner lives and actions of many contemporary women. Her audiences can appreciate such storylines because they are true and because they are given the respect they deserve. Depictions of black characters in film and television especially usually fall into one of a limited number of tropes: the tragic, the sassy, the perfect. Olivia does not fit neatly into any one category. She is a woman in the wrong kind of relationship, one that is forbidden and heartbreaking. She is smart and authoritative and strong in self-assuredness. When she is right, she is very right and she will let you know it. This same characterization can be seen throughout her shows. The characters are messy and complicated. Their decisions are often riddled with holes and major consequences. Like real life, Rhimes understands that these are choices people make – white or black, young or old – and the things we normally consider their otherness have little bearing on the matter. She does not treat diversity as if it’s something to dwell on. The experiences of the average person of color do not revolve around their race, ethnicity, gender, or other factor that makes them a minority. Rather, their experiences are just like those considered a part of the mainstream. When race is brought up, it is done casually and pointedly, not overwrought. But most importantly, Rhimes’ shows are fun. Although Grey’s Anatomy has diminished in quality the longer it has been on the air, the show in its earliest state (and Scandal in its current state) was an engaging, exciting, and unique program. Grey’s Anatomy, currently in its ninth season, continues to outperform many new and established broadcast television shows. Scandal reached its series high this week. Important Television can and should be fun. Yes, audiences desire something plot-driven, well thought-out and rich, but they also desire something to keep them coming back week to week. Rhimes succeeds where others fail. If we desire a future entertainment industry that reflects the diversity and stories of the world we live in, we should do more to praise those such as Rhimes who actively work to reflect that world.